The full Pink Moon rises behind the medieval village and castle of Monsaraz in Portugal's Dark Sky Alqueva Reserve. Miguel Claro is a professional photographer, author and science communicator based in Lisbon, Portugal, who creates spectacular images of the night sky. As a European Southern Observatory photo ambassador, a member of The World At Night and the official astrophotographer of the Dark Sky Alqueva Reserve, he specializes in astronomical skyscapes that connect Earth and the night sky. Join Claro here as he takes us through his photograph "A Full Moon Above the Medieval Village of Monsaraz." 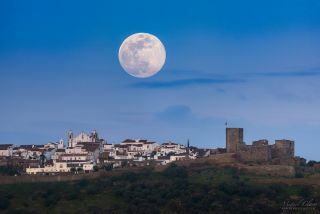 The full "Pink Moon" of April 29 adorns the daytime sky over the medieval village and castle of Monsaraz in this photo taken in Portugal's Dark Sky Alqueva Reserve. A more dramatic black-and-white view of April's full moon shows the seemingly huge satellite rising behind the medieval castle of Monsaraz in Portugal's Dark Sky Alqueva Reserve. To create the illusion that the moon appears unusually large compared to the objects on Earth, I just had to find the right spot about 2.3 miles (3.7 kilometers) from the castle. At that distance and using a long camera lens, achieving this so-called "moon illusion" is simple and doesn't require any photo-editing software. For this photo, I shot using only a 600-millimeter (24 inches) lens. Editor's note: Don't miss the full "Strawberry Moon" tonight (June 27)! If you captured an amazing astronomy photo and would like to share it with Space.com for a story or gallery, send images and comments to managing editor Tariq Malik at spacephotos@space.com.